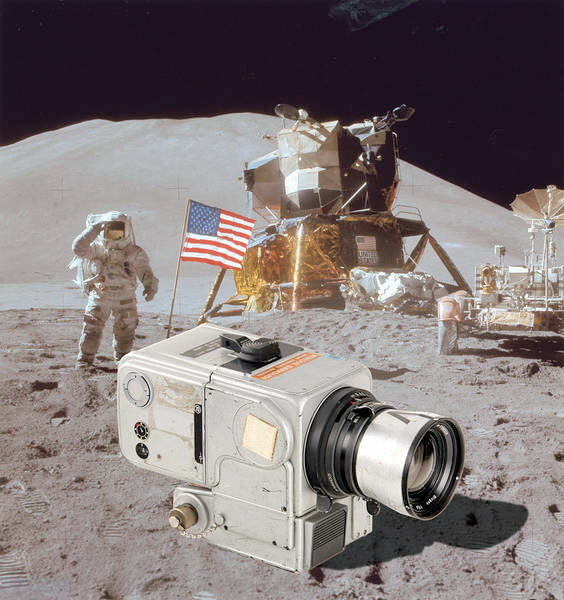 — A camera claimed to have been used on the moon's surface sold for almost $1 million in Austria Saturday (March 22), despite concerns about its history. 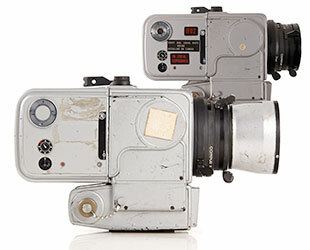 The WestLicht Photographica Auction in Vienna registered a hammer price of 550,000 euros (660,000 euros with the buyer's premium, or about $910,400 US) for a Hasselblad Electronic Data Camera (EDC) that the gallery described as having been used by astronaut James Irwin during the Apollo 15 mission. 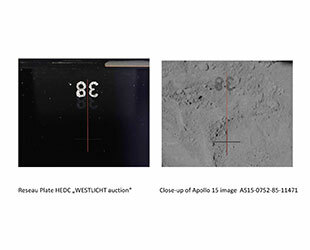 "This Hasselblad used on the fourth NASA [moon landing] mission between July 26th to August 7th, 1971 made its way back to Earth, finally landing at the WestLicht auction house," the sale's organizers wrote. 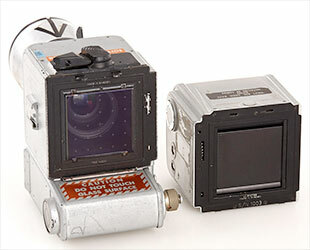 The final sale price far surpassed the 150,000 to 200,000 euros (about $200,000 to $275,000) that WestLicht had estimated the lunar Hasselblad to be worth. 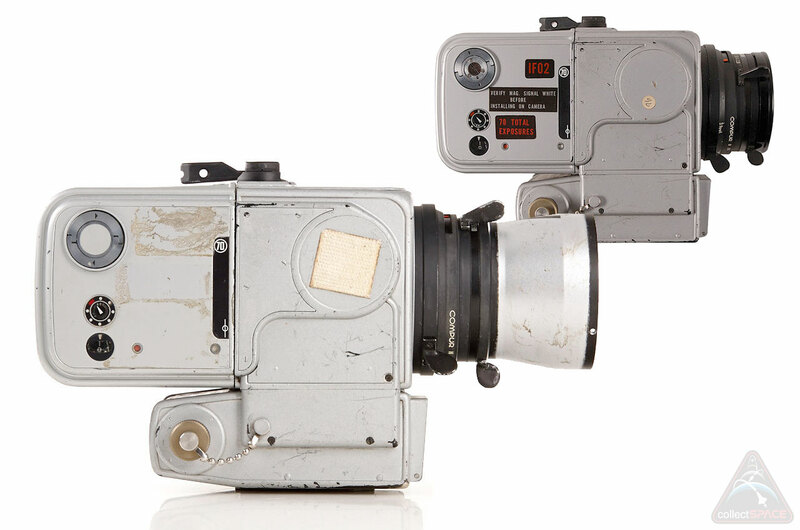 The camera's lot opened for sale at 80,000 euros (about $110,000). Update: In a statement released Monday (March 24), the WestLicht Gallery identified Terukazu Fujisawa, founder of Japanese retail chain Yodobashi Camera, as the winner of the Hasselblad camera. Most of the cameras that the Apollo astronauts used on the lunar surface were left there to reduce the weight of the moon-rock-laden returning spacecraft. Evidence exists however, for at least four of the Hasselblads to have been brought back to Earth, including Irwin's, which had locked up during the mission and was returned for analysis. 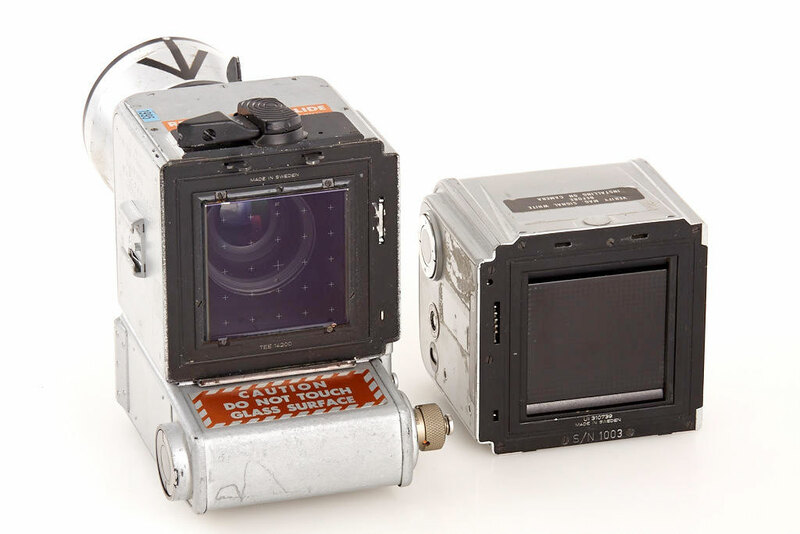 If the camera sold by WestLicht is the same Hasselblad EDC that Irwin used to take 299 photos while exploring the moon, then it is not clear how it made its way from federal property to private hands. A 2012 law made it legal for the Apollo-era astronauts to own, and if so desired, sell the spent equipment that they brought home as mementos. 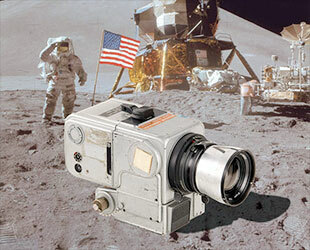 But as the Apollo 15 camera was never a souvenir and did not originate from Jim Irwin's estate, that law does not apply. As acknowledged by WestLicht though, this is not the first time this camera — or at least parts of it — have sold. Two years ago, RR Auction of New Hampshire became at least the second auction house to offer the same camera body for sale. The camera, which sold then for $42,704 to the person who later consigned it to WestLicht, included a different lens and film magazine. 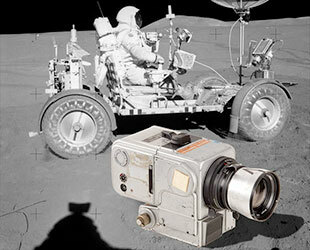 Perhaps more importantly, RR had made no claim that the camera had been to the surface of the moon. Instead, a letter from a former NASA photographer stated the camera "flew in the Apollo command service module during one or more lunar flights." In other words, if the camera did fly, it remained in orbit around the moon (only the lunar module descended with the astronauts to the surface). When the WestLicht gallery released photos of the camera for its auction, another difference was noticed. In addition to the lens and magazine being changed out, a white Velcro square now appeared on the camera's body. WestLicht did not address the addition of the Velcro in its catalog and the camera's consignor declined to comment. But WestLicht did share a new detail about the Hasselblad on the same day that it sold. "It has moon dust on it," Peter Coeln, the gallery's owner, told the AFP news service. Moon dust aside, according to WestLicht, the Hasselblad EDC's flown-to-the-moon status hinged on a serial number etched onto an interior glass plate. 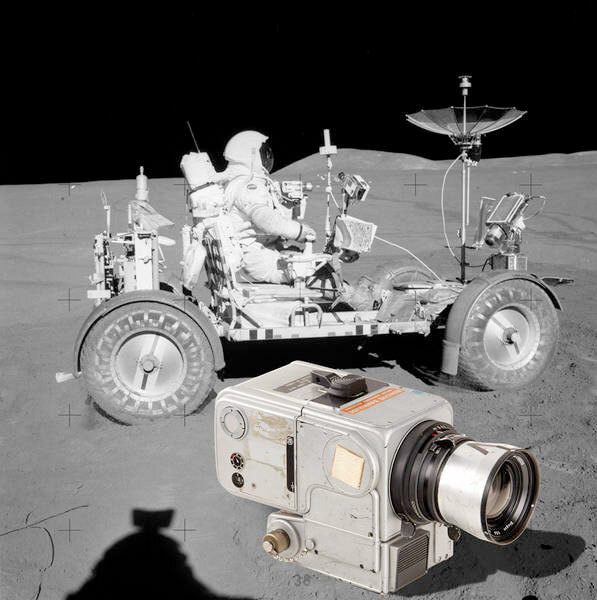 "[The number] is 100-percent proof that this camera is the real thing and really was on the moon," Coeln told AFP. "This historical camera comes... with [a] reseau plate with matching body number 38 to imprint on taken images," the camera's auction description reads. The Reseau plate was a transparent piece of glass used to superimpose calibration crosshairs — and the camera's plate number — onto photos recorded with the camera. 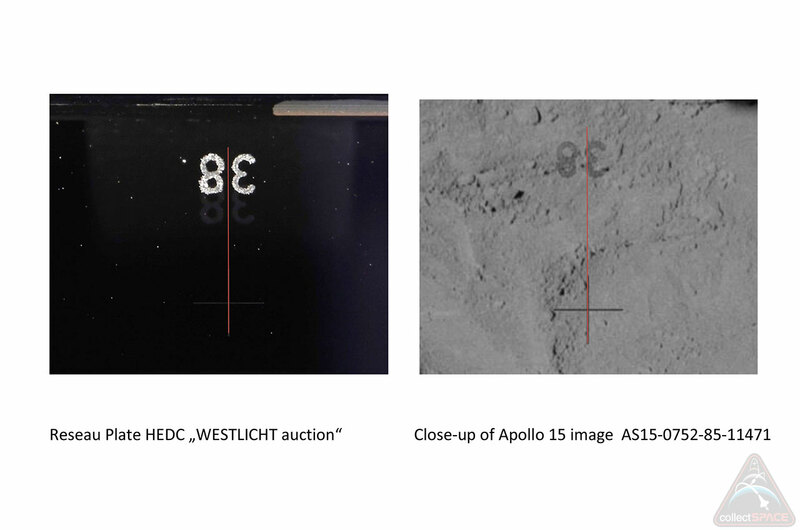 To support its claim, WestLicht included a photo of the plate and a close-up of the "38" as it appeared on an Apollo 15 photo print as part of its catalog listing. Those images however, raised additional concerns. "The Reseau plate number upon which all this provenance relies has been engraved into the plate," a collector wrote on the collectSPACE forums. "From the DATA cameras in my collection, it is evident that these numbers were not added, and certainly never engraved, post-production, but included during the manufacturing process." Another space history researcher took the photos released by WestLicht and overlaid them. If the plate was the same that flew, the crosshairs and the '38' should have lined up with those imprinted on the photos. "I think it is obvious that both are not identical," he wrote, but added that the camera body might still have flown. "It could be that post-mission the original Reseau plate was damaged and had to be exchanged."